What was school like for your great-grandparents? What games did they play? How did their mothers cook and wash? Did they shop at a supermarket and then carry the groceries home in a plastic bag? Visit the Hornsby Shire Historical Society's Museum in Kenley Park, Normanhurst to experience hands-on living in the 1930s. 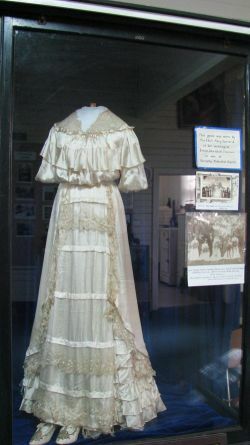 Managed by members of the Society, the museum’s permanent displays focus on a typical childhood in a rural district, while the temporary displays highlight the changes in work and leisure in Hornsby Shire. Together they provide a memorable experience for families, leisure groups and school students. (HSIE-appropriate program available on request). Groups of school children, especially those in Stage 1, participate in a series of activities directly relating to the current HSIE curriculum.These six rotating activities are taken by experienced Museum staff, many of whom are teachers themselves. Exhibiting objects from both domestic and work spheres, our collection includes a silk wedding dress with tiny matching shoes, a hand-made Depression quilt and a local boatbuilder’s scale model. Our extensive collection of photographs has recently been digitized and is now accessible to both casual viewers and researchers. Adjacent to the Main Northern Railway and sited in a large shaded park with a children’s playground and public toilets, the Museum is easily accessible by rail and bus and plenty of street parking is available.